It's been nearly 48hrs and it just about feels that The Climbing Works is returning to normal. 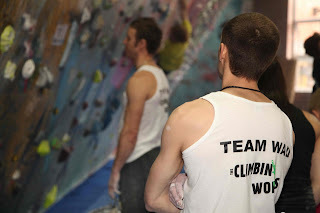 There has been little rest bite from the weekend as we reset, rebuild and recover from undoubtedly the most successful CWIF we've ever had. We're still sorting everything out but we've got the Final scores now available to view and you can view the Semi-Final results and preliminary qualifying results on our blog. We'll get everything finalised by the end of the week including the Team results. Below is a report from the weekend that will hopefully give you an idea of what it was like to be here. To make a climbing competition successful you need many different components to come together just right. 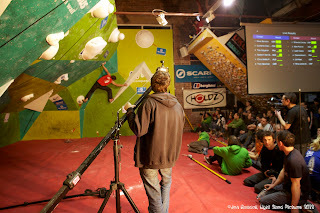 You need high quality competitors, an impressive wall, an enthusiastic crowd and top-level routesetting. 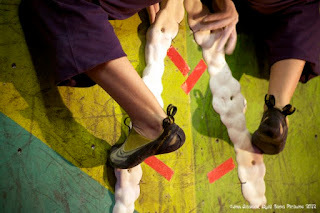 The 2012 Climbing Works International Festival had all this and more. 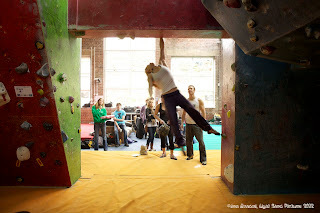 We also had perfect weather (which would usually be a huge detriment to an indoor bouldering competition) giving the Sunday especially a feel of early Summer as people enjoyed the sunshine at the free afternoon BBQ. 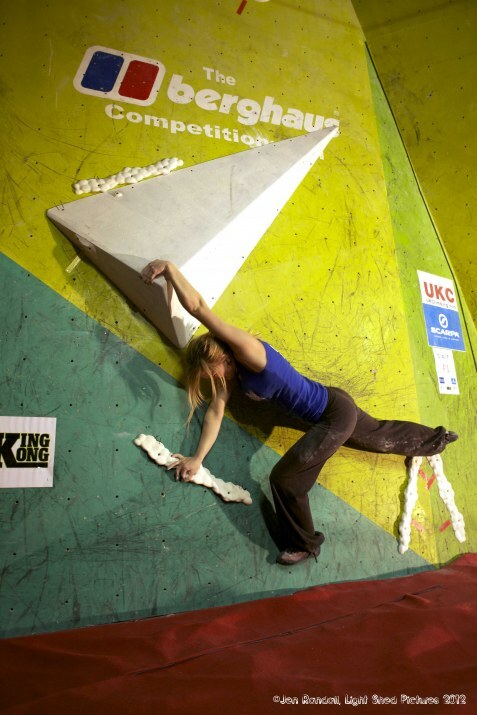 Shauna Coxsey going big on one of the qualifier blocs. The Saturday morning actually started off grey but with the arrival of the first of the 344 competitors the sun broke out and we opened up the windows as the temps began to rise. Split over 2 sessions (am & pm) the qualifiers were designed & set to whittle the climbing masses down to just 20 Men & Women who would move through to the Semi's on Sunday afternoon. 30 blocs on White holds that ranged from the physical to the outright technical had the competitors realising that they had to bring their A game just to get a personally decent score. Many competitors were left bemused by the creations but the qualifying results show a range of scores from 0 to 291 with very few tied places/scores. 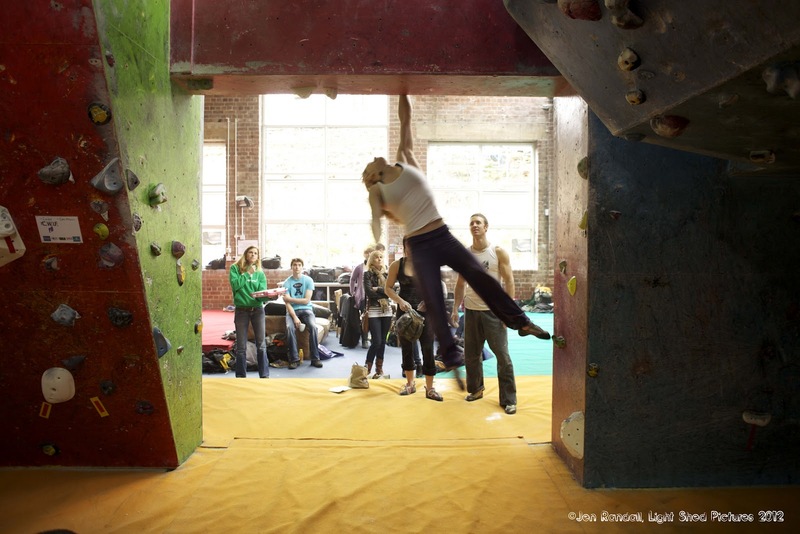 It is an incredible skill to separate out so many people and it is high praise for the route-setters that they set such a diverse circuit. The top score was from Dave Barrans who got an incredibly 291, climbing every problem with 28 flashes (10pts), 1 2nd go(7pts) and 1 3rd go(4pts). A performance that stood him in good stead for the rest of the weekend. Sunday morning brought beautiful sunshine and it was rather humbling for us to see such a big crowd here for the Semi Finals. 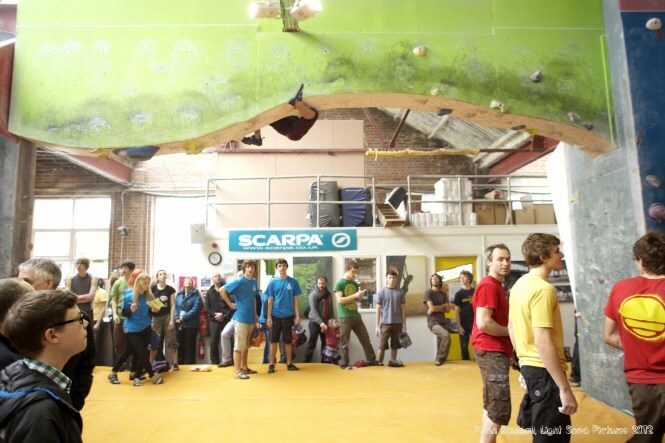 In 2009 we had a similar size number for the main Final, in 2012 it was fantastic to see not a free seat as the first competitors came out to compete at noon. 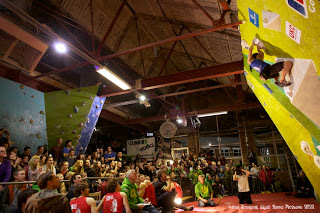 A tough set and alot of tired climbers from the day before meant that many struggled to get high on many of the blocs. It wasn't till near to the end, with the experienced competition climbers coming out, that the blocs started to get sent. 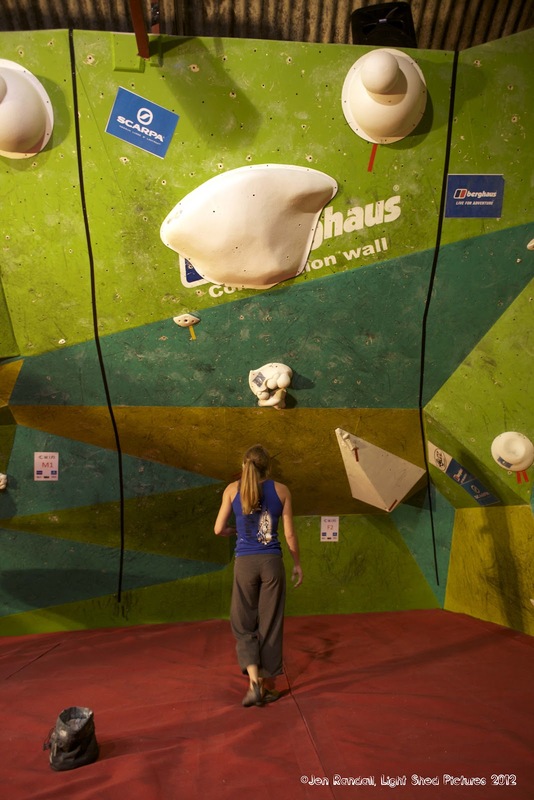 Shauna Coxsey was the star of the Semi's, looking fresh and confident, as she sent all 4 women blocs to go into the Finals as top female. An afternoon break with the Free BBQ in the Spring sunshine saw the crowd relaxing while the finalists eased their aching bodies anyway they could. 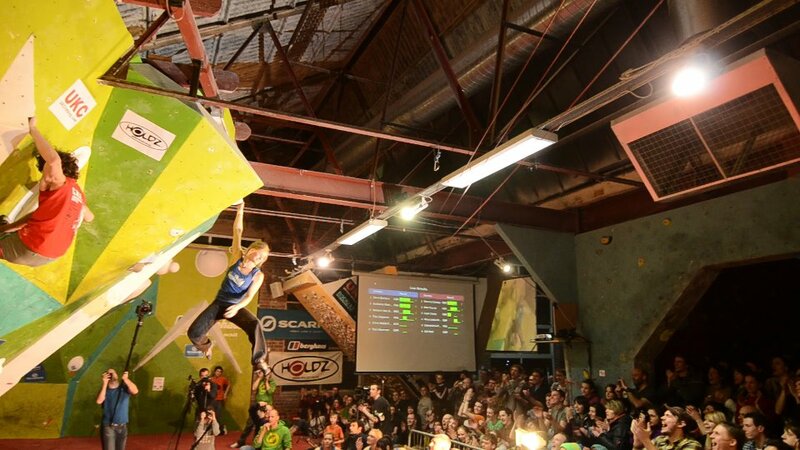 The CWIF is one of the toughest competitions out there as it demands so much fitness, skill and strength to compete at such a high level over 2 days. A 30 bloc qualifier & a tough semi-final takes alot out of the most experienced and fit climber and getting something back is a skill in itself at this level. With only 3.5hrs to recover, some of the finalists reverted to finding a place to lay their head down for a power nap. For the crowd it was time to get stuck into some burgers and beer. With 1 hour to go to the main event, we were astounded to find that most of the seats were already full and it was getting close to standing room only for those arriving even with plenty of time to spare. By 6pm there was no free space anywhere so any late comers were left with the big screen that we added this year (TDC Sheffield did this and the PA this year - a big thanks to them) internally which was showing the webcast to those who could not get a good view of the wall. 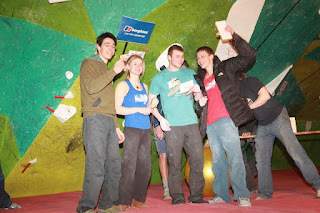 The Final went down to the wire in the Mens with the Final problem 4 leaving three men in the running with a chance to win. 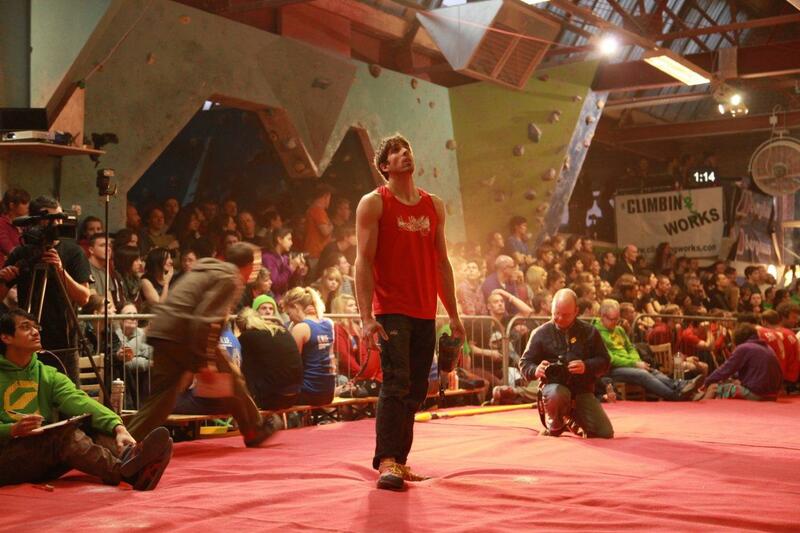 First onto this bloc was Dave Barrans who knew if he climbed the bloc he would win. 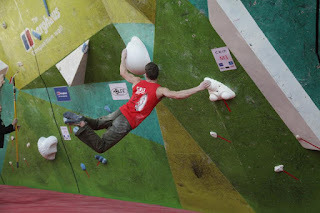 On his flash attempt he climbed smoothly to the final few moves which involved a struggle with a volume. After what seemed an age he fell while readjusting on this unconventional hold. All Dave could do now was wait nervously as Ned Feehally made his way to the starting holds. 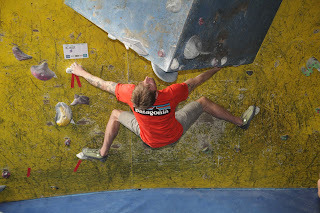 Ned could replace Dave in first place if he did this bloc within 2 go's and it looked possible as he cruised his way to Dave's highpoint only to be defeated by the tricky sequence. His next attempt was strong until a deep drop knee flared up a recent knee injury which eventually stopped him in his tracks. It was left to Guillame Glarion-Mondet to steal the victory if he could send this final bloc. His second go saw him throwing for the final hold but just not far enough. You could feel the tension as he got on for a last go as his time ran down to zero. 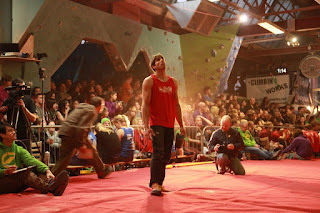 A tired last attempt saw him fall from below his highpoint and with that Dave Barrans knew he was the 2012 CWIF winner. 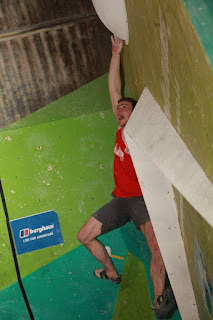 In a couple of previous competitions Dave has finished in 2nd place, this weekend he climbed like a man on a mission and he thoroughly deserved his win. In the Female competition, we had the recent American ABS champion Alex Puccio going up against Shauna Coxsey (who had finished 3rd in the ABS) with strong competition from British team members Leah Crane and Mina Leslie-Wujastyk. 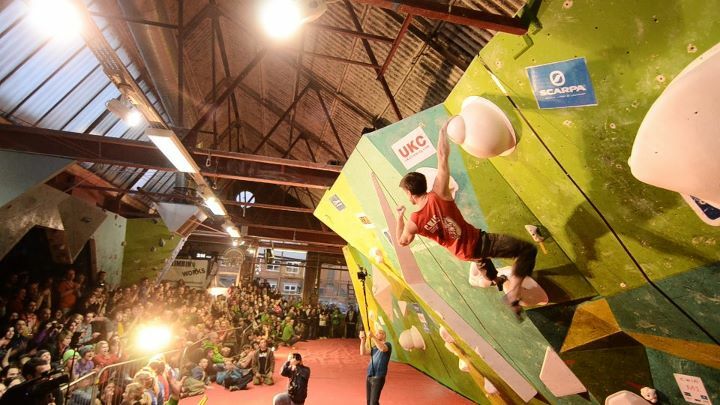 Bloc #1 was a technical slab with a dyno finish and as with any competition its the small things that matter. Alex & Shauna both threw for the final hold with a big swing to control as you caught the last hold. Shauna managed to stick it while Alex agonizingly held it for a moment before slipping off. Bloc # 2 was more Alex's favoured style being steep and powerful and she cruised it with aplomb. Shauna also flashed it with the other ladies struggling with the massive undercut move at the start. 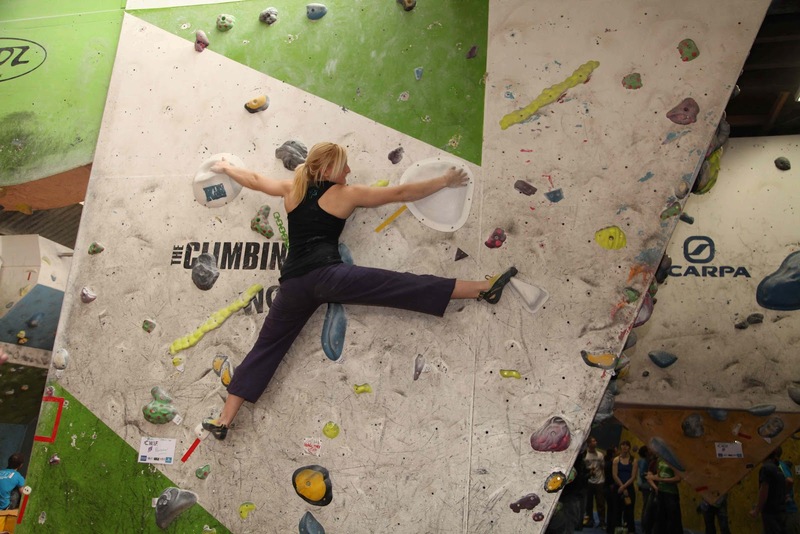 Bloc 3 gave a chance for the ladies to show their dynoing skills. It was here that we saw one of the most starting bits of climbing with Alex catching the dyno one handed leaving both her and the crowd shaking their heads in disbelief. 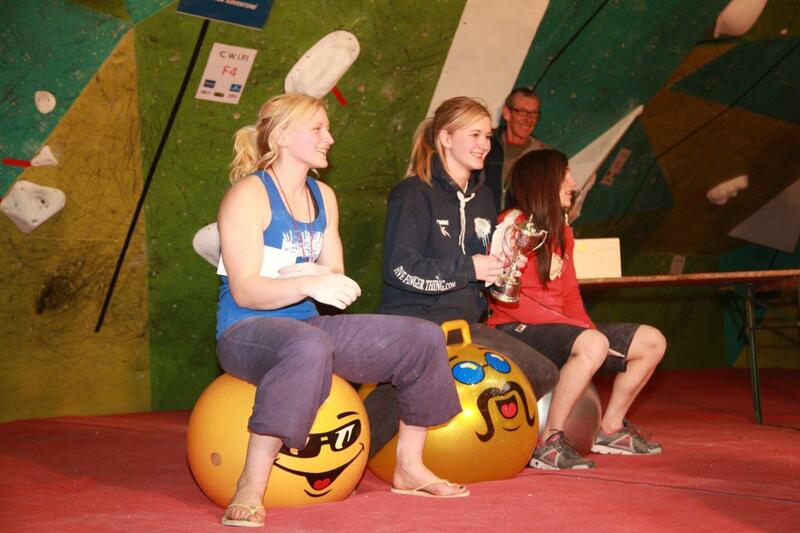 Shaua & Mina both sent but moving onto #4 it was all down to Alex & Shauna to see who would take the win. 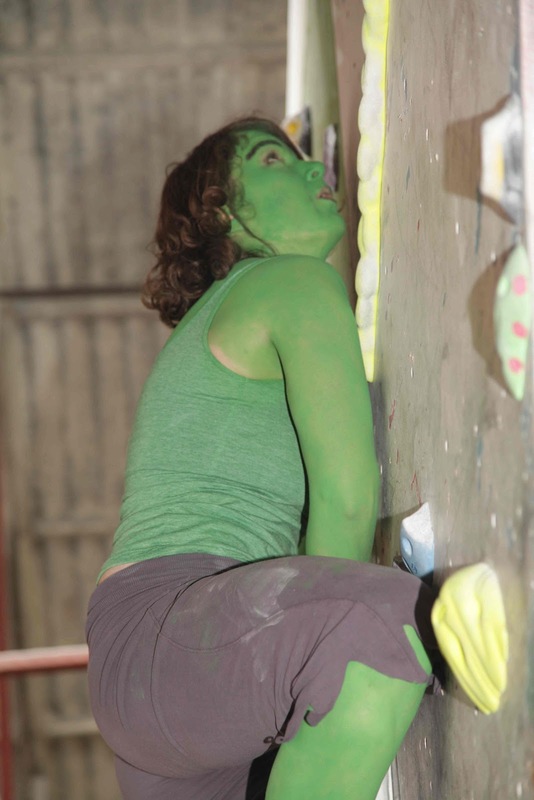 Alex struggled with a move on #4 failing to send the bloc which meant that by the time Shauna stepped under bloc 4 she knew she was the CWIF female champion for 2012. She crowned the win by showcasing her strength & skill by not just becoming the only female to complete #4 but also flashing it. 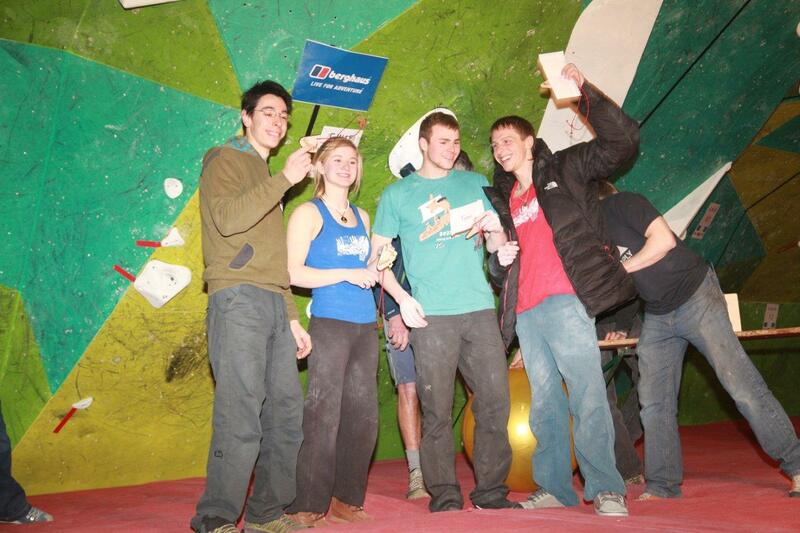 Team Beastmaker with their £500 winnings from being the top scoring team from the qualifiers. Michele Caminati, Shauna Coxsey, Ned Feehally & Chris Parsons - strong group. There are many thanks to be given out but a huge one has to go to the routesetters who did an amazing job and who also donated all their wages to our chosen charities: Macmillian Cancer Support & Edale Mountain Rescue. A big thank you to Scarpa & Berghaus who provided a massive amount of prizes that also helped raise alot of money (we currently think £3k+) for the Charities above. Our other sponsors, UKC, Holdz & King Kong & the Broadfield Hotel, who also helped make the CWIF alot more fun.